Easter is a time for celebration with the family, and even we are partial to an Easter Egg Hunt or two! But at Easter time, it’s important to plan ahead to avoid any nasty surprises, including consumption of chocolate by our dogs (and other unfavourable food and drinks including sultanas from hot-cross buns, caffeine and alcohol) that can have a potentially deadly affect on your dog. Jetpets Vet Dr Lucy explains that “chocolate contains a chemical compound called theobromide and is toxic to our furry friends.” Therefore it is important to keep chocolate out of reach and when planning your Easter Egg Hunt, avoid hiding Easter eggs close to the ground if your dog is on the prowl! Remind your children and guests not to feed the dog any type of chocolate or toxic foods. Better yet? 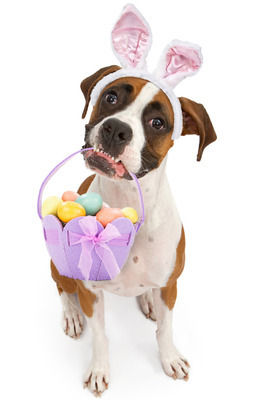 Make sure your dog is supervised at all times, so there is no chance for a sneaky snack on an Easter egg. If your dog does manage to eat chocolate or another toxic substance, it is important to stay calm and contact a Vet immediately. There is a window of approximately 15 to 60 minutes after ingestion that a Veterinarian may be able to successfully flush the chocolate from the dog’s stomach. Even if there are no signs and symptoms, if you suspect your furry friend has eaten some chocolate, don’t hesitate to get in touch with your Vet for a thorough examination as this could save your dog’s life.